Job offers for student workers | Work and study at the same time? At IKV you can! Why not work and study at the same time? At IKV you can! An important factor for successful research at IKV are the over 150 student workers. It is part of IKV's self-perception that a good scientific engineering course entails far more than just passing exams. In exercises designed to accompany the lectures, the students gain an initial insight into practical working on machines and equipment. Students who are employed in the IKV working groups have far more opportunity to collect experience in this field and acquire additional knowledge. 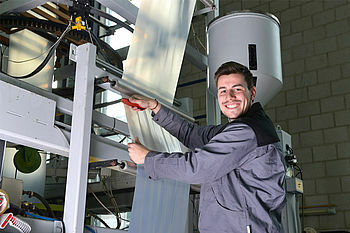 IKV therefore endeavours to offer every student of plastics technology a position as a student worker at the Institute. Student workers are directly involved in the research and benefit both technically and personally. >> For current job offers please switch to our German website. offers an open and friendly working atmosphere.